Ray Fell at Elland Road in 2002. Ray Fell’s 31-year tenure as chairman of the Leeds United Supporters Club tells only part of the story of his commitment to it. Before his election in 1985 he was treasurer, fundraising secretary and one of the founders of LUSC’s Britannia branch in Holbeck. His membership began more than 50 years ago, around the time of Leeds’ first FA Cup final appearance. On Sunday, at the group’s annual general meeting, Fell resigned reluctantly as chairman on the grounds of ill health. “It’s a great disappointment to me,” he said. “I’ve always worn the position with pride, just as I’ve always been proud to be involved with the Supporters Club. But ill health has caught up with me. At its height, around 10,000 Supporters Club members were represented by Fell. LUSC is Leeds’ oldest fans group and before the surge of membership in the Leeds United Supporters Trust (LUST) in 2011 and 2012, it was also United’s largest. “Membership always goes up and down but there were around 10,000 members at one stage and 90 branches worldwide,” Fell said. “I don’t know the exact numbers now but we’re still a big, active group. “Ken’s attitude to supporters changed things for us,” Fell said. “We’re an independent group but our support is never in question. I got the feeling that Ken wanted to do away with the Supporters Club or to take us under his wing. That’s how it seemed. “Before him, we’d always had very good relations with different chairmen of the club and that’s probably because they were Leeds United supporters themselves. They would speak to us and give us an idea of any plans which would directly affect the fans. That doesn’t mean that they let us make decisions but they consulted us and talked things over. They were happy to hear our voice. “I felt that last season was a bad season for the fans,” Fell said. “Not only because of the ability of the team but because there was so much unrest and so much action publicly against the club. 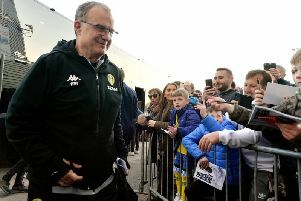 “Our attitude as the Supporters Club is that we’re here to build relationships, not to destroy them, and from the point of view of wanting things to go well for Leeds United, it’s depressing to see such strong feeling against (Cellino). “Everybody has reservations about the present position of the club and the owner himself but I think more people would try to support him if he’d only come out and speak to us properly, telling everyone what his ambition is and how it’s going to be realised. Like every owner, the fans are there to work with him if he engages.